He is thrilled with the thought of bowling at Virat Kohli in the IPL. The Indian Premier League (IPL) 2019 auction was not a mega auction and thus only a few players earned contracts. A total of 60 players were bought by the eight franchises and only four of those were South Africans. 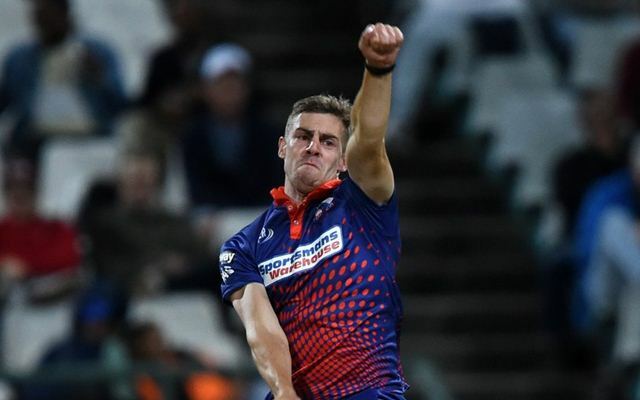 Anrich Jortje who had a phenomenal Mzansi Super League representing Cape Town Blitz was signed by the Kolkata Knight Riders for his base price of Rs 20 lakhs. The other three South Africans sold at the auction were Colin Ingram, Heinrich Klassen and Hardus Viljoen. Nortje is certain he wouldn’t have been picked in the IPL had he not played the MSL T20 and made a mark there. It was the biggest platform in his career and is looking for a lot more of it with the IPL. He knew that the teams had shortlisted his name but wasn’t really hoping for a contract. It was while shopping for meat that he got to know KKR had put up a bid to rope him in. “I didn’t really expect to get picked up, but I thought, well, definitely give it a shot. When I get on the shortlist I was quite happy. I was in Struisbaai in the Western Cape, just in a shopping centre when someone phoned me and I heard,” Nortje was quoted as saying by ESPNcricinfo.”I was busy getting meat for a braai that night,” he added. “Without that [Mzansi], I wouldn’t have been picked up. It was my first big T20 tournament, I’d like to get more exposure from here on, and IPL would definitely help that,” the pacer said. His ultimate goal like most cricketers is that to represent the national team. The 25-year-old wants the IPL to aid his selection into the Proteas team. Which format he gets to play is little important, what matters is that wears the green and gold. Nortje is known of his exciting pace and in the three MSL matches he was picked for, returned with 8 wickets while also being economical. He just wants to get a game in the IPL, the focus is not on the opponent but on the job at hand. However, the prospect of bowling to Royal Challengers Bangalore captain Virat Kohli definitely is something he is thrilled about. The right-arm pacer termed Kohli an unbelievable player and will plan for him on the day if they faceoff. “Bowling to Virat? Wow, I don’t know. He’s an unbelievable player. I’ll have to assess it on the day, assess the wicket, and just go according to the plan of what the coach and the team wants,” he added.